Like any blogger, I strive hard to have decent traffic to my blog because, as they say, what is the use of your writing articles if no one reads them. At the start, getting people to read my blogs was harder for me than having topics to write about. My blog was initially targeted to have a niche audience in the persons of i-café owners and my topics then were almost exclusively about their business. After some efforts to promote my blog to them and based on referral traffic statistics I had then, this site did get readers from the industry and some of them are still visiting regularly. 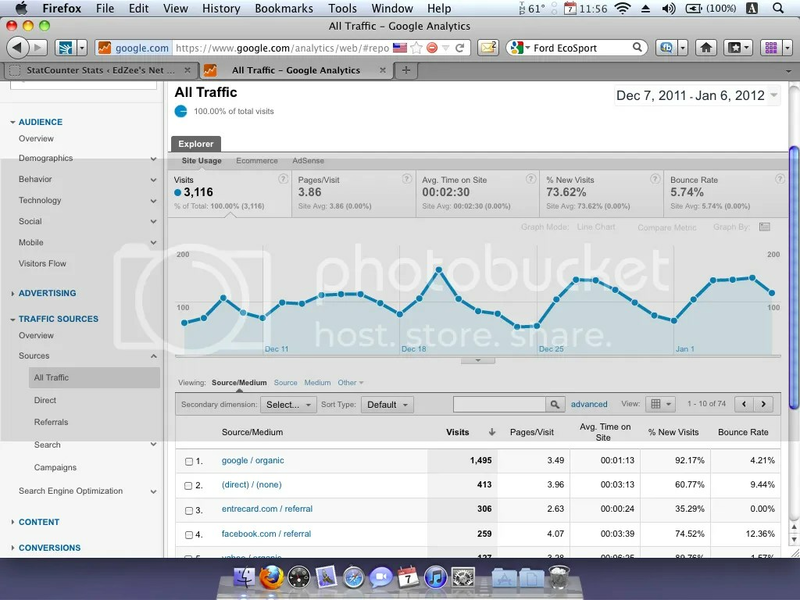 Aside from Google Analytics (image shown), I am also using StatCounter plugin to track visits to this site. The two (2) traffic monitoring tools show a bit different figures but they do tally percentage-wise. Both show that a little more than 50% of my visitors are organic or coming from search engines. One-third or 33% of them are from referral sites like blog advertising networks, online forums and social media. The rest of my visitors, 10 to 15%, come directly from their browsers. About six months ago, my blog used to have more visitors from referral sites than from search engines. This was because I was then using blog advertising networks with active traffic exchange. I was advertising this blog in Adgitize and CMF Ads (both are now closed) for more than one year until I decided to stop because I feel I was not getting real readers from them. The very high bounce rate (more than 80%) and the very short stay (less than 20 seconds) were proofs that visitors from the networks just come and go. I am still with EntreCard but I may decide to drop it also as soon as I find a suitable source of traffic to replace what I am getting from the network. Lately, I am participating on active blog promotion in social media especially Facebook (FB) where Filipino bloggers have grouped together for a common goal of exchanging traffic. Because of this, my blog is now getting visits from co-bloggers aside from a few of my ‘FB friends’. The traffic from social media has partially replaced the ones I lost from blog ad networks but should small bloggers like me be happy with this kind of engagement? More on this later. I still need more time to learn about this google analytic, thanks for sharing this. Hoping for more readers and visitors too, because most of my readers are just bloggers only.